Sonargraph defines a "Quality Model" as a group of settings and files aimed to help you getting started with your code analysis. When creating a new system you can optionally use one the pre-defined quality models that ship with Sonargraph . The default quality model suggested depends on the type of system you want to create: If you are creating a system manually, you get the Core quality model suggested, which contains language-independent settings and scripts. If you are creating a new software system using one of the language-based wizards, you will get a quality model customized to the corresponding programming language. 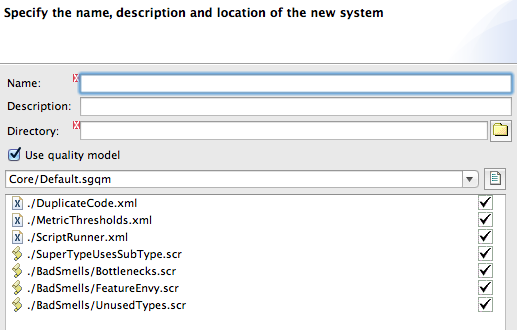 You can include or exclude quality model elements as you see fit for each project.